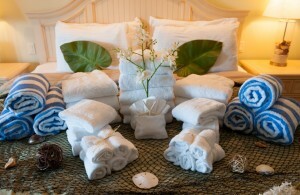 In Anna Maria Vacation’s continuous effort to bring only the best quality experience to our guests, we are proud to announce that we offer a professional linen service at many of our vacation rental properties to better enhance your upscale vacation experience. This luxury amenity can now be enjoyed in most of our properties and provides the guest freshly laundered, high quality linens that are in place and ready for your use upon your arrival. These high-quality linens are washed in a commercial setting using the latest and best technology. 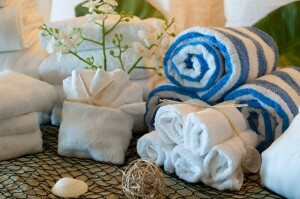 Take the fuss and worry out of packing your private sheets and beach towels knowing that when you arrive to your dream vacation rental, in place are the high quality and commercially cleaned luxury bedding, bath towels, wash cloths and beach towels ready for your stay. Eliminate the guessing game, free up luggage space and breathe easy knowing that everything is already taken care of for you. This same philosophy extends even to your departure— nothing to wash, dry, fold or having to fool with trying to squeeze into an already tightly packed suitcase. When you are browsing our website, simply look for the orange “Linen Service” icon to know whether that particular rental property offers this luxury amenity. Please feel free to call our office and speak to one of our reservationists who are more than happy to provide any additional information. Toll free phone is 800-737-9855.